Y’all. It has been forever. I have had so many posts swirl around my head, but I usually really do write these during naptime, and ever since third trimester started, Ellie’s naptime is my naptime. I told my grandma I was tired the other day and she said something like, “You ain’t seen nothing yet, sweetie.” I know she’s right, but I also know that the kind of tired I am in the third trimester and the kind of tired I am because I don’t sleep at night and I chase kiddos around all day are different. That tiredness can be helped by wonderful things like coffee and naps while Nana babysits, this tiredness can only be helped by not being pregnant anymore. That being said, I’m still definitely enjoying pregnancy and am trying to savor these last few weeks as a momma with one baby on the outside. And now, I guess I just have a few updates that I’ve been meaning to write about, but I just keep falling asleep. My grandfather passed away shortly after I wrote this post. Early in the morning on Father’s Day, he went to be with Jesus. It wasn’t anything like I imagined– I actually found out about it on the internet. We had kissed him goodbye the night before and gone home to get some sleep, and I woke up to the news on my Instagram feed. It was jarring. And when we showed up at the house he was just gone. And there was an empty bed where he used to be, and the world was going about its Sunday like nothing ever happened. Like nothing ever happened. And I knew that he was finally free, finally with Jesus, but I was still sad. I took my daughter on a walk to the park because don’t you sometimes just need some space when something like that happens? Sometimes when you’re grieving and the world just seems to go faster and faster, don’t you just want to pause and make space? That’s why I walked to the park and sat on the swings that Sunday. To make a little space in that Father’s Day for my grandpa. I’m sure I’m not done writing about this, but that’s all I have to say for now. I also went to the high-risk doctor to have my ultrasound sometime between when I last wrote and now. In her awesome Long Island accent, the doctor told us that her ultrasound technician had been alerted to look for a lake in my placenta (remember, not a leak, people) and she “didn’t appreciate that at all.” I was kind of confused (again) but it turns out what she meant was that her tech didn’t find anything to be concerned about and after the doc had a look, she agreed. So, thanks be to God, we got out of there with a clean bill of health and as close to 100% certainty you can get that there will be a sweet little girl joining our family in less than two months! We were very grateful to hear that everything looks good. Thank you for your prayers. Please continue to pray. I have struggled almost daily with trusting the Lord through this pregnancy. He is still at work, and I am so grateful for the story he is writing in our lives today, for the gift of the family he has given us today, and I’m still asking him to help me learn not to worry about tomorrow. My goal is to be back to writing at least once a week because I really miss it and because I think it’s important. Sometimes the hardest part for me when I fall off like this is getting back up, so now that we got this out of the way, hopefully there will be better things to come. I have a few good ideas– we’ll see what happens. I always have. This year’s birthday was especially wonderful. Friday has been David’s day off for a while, so we made a two-day celebration out of it, and it. was. perfect. David and I have been learning a little more about the 5 Love Languages. I have suspected for a while that Gifts was a pretty strong one for me, and I was right. I love giving gifts just about as much as I love receiving gifts. So I decided that this birthday would include some gift giving on my part. I suspected that it might just increase my love for my birthday even more, and I was right again. 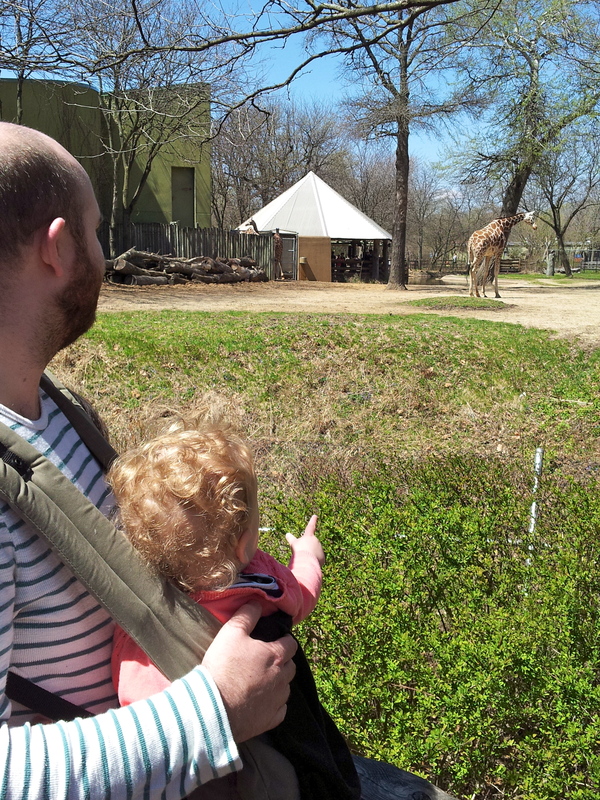 My first gift was to spend some birthday money I received on a zoo membership for our family. I know Ellie probably won’t have any memories of time spent there, but I’m looking forward to spending time there with her (and David) this summer, before Little Sis gets here. 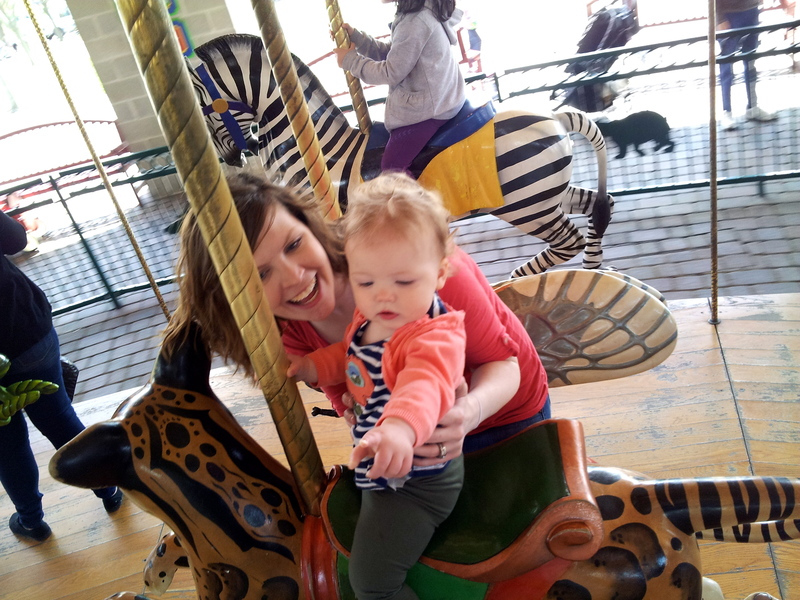 We went for the first time on Friday, and Eliana loved looking at the animals, waving to everyone, practicing her walking, and playing with some of the exhibits. 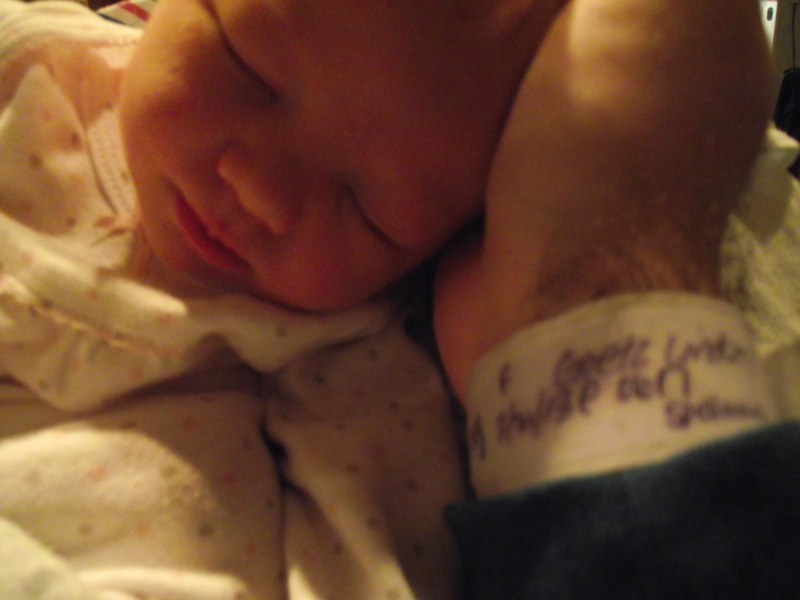 We spent the evening together relaxing, but woke up in the middle of the night to sweet Ellie’s first fever. It was so sad to see her feeling unwell, but I can’t lie. I love baby cuddles, and Ellie just hasn’t been as into them now that she knows how to walk. We spent my birthday with some dear friends from college, eating delicious food, talking, and spending time together. It was a blessing to me to celebrate with them, not only my birthday, but also the new journeys the Lord is taking each of us on. It was a privilege for me to give small gifts that celebrate these exciting new places the Lord is leading them. I think I hesitated to claim Gifts as a Love Language because it felt selfish to me, but I’m realizing that the joy is just as full in the giving as in the receiving. I felt new freedom to take a lot of joy in getting thoughtful gifts from so many considerate people, and it was an added joy to be able to give a few small gifts, also. The day wrapped up with birthday dinner with family and a whole night of taking care of a poor sick baby. I thank the Lord for the grace to see even this challenge of parenting as a gift. 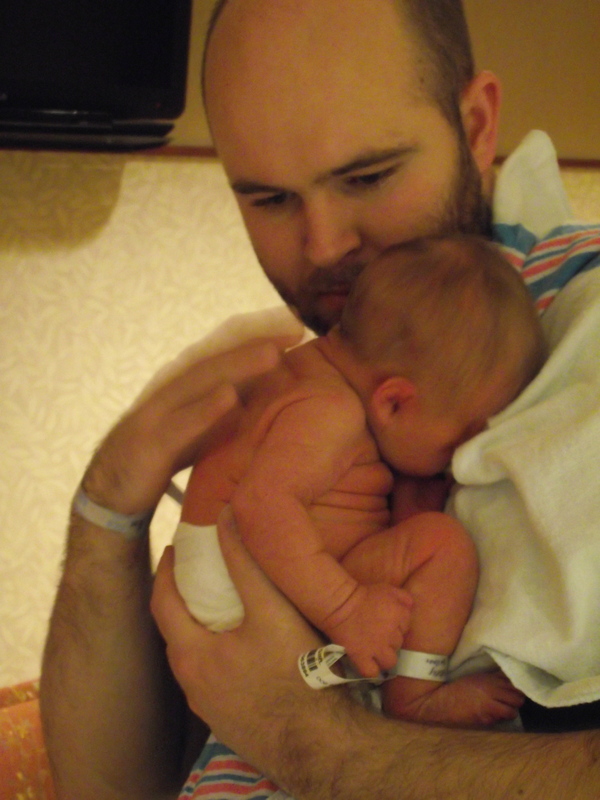 I was tempted to feel self-pity that my daughter would have her first fever on my birthday. But I was gently reminded of what a privilege it is to care for and cherish this special life, and felt called to recognize the opportunity to give her the gift of my time, my patience, and my love while she felt sick. 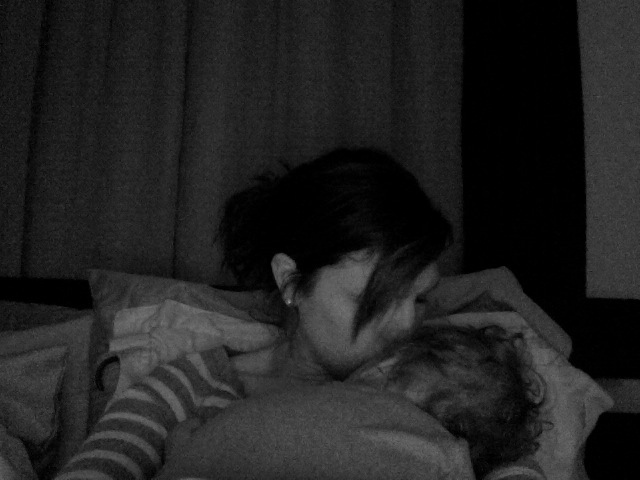 It seems strange to write, but I really loved spending the last hours of my birthday evening holding my sleeping babe, not dwelling on how many or few hours of sleep I might get that night, but just thanking the Lord for all the fullness of the gift of being this sweet girl’s momma–all the hugs, drooly kisses, and smiles; and all the tantrums, huge messes, and late nights/early mornings of care taking. little sister…expected sometime around September 15th! 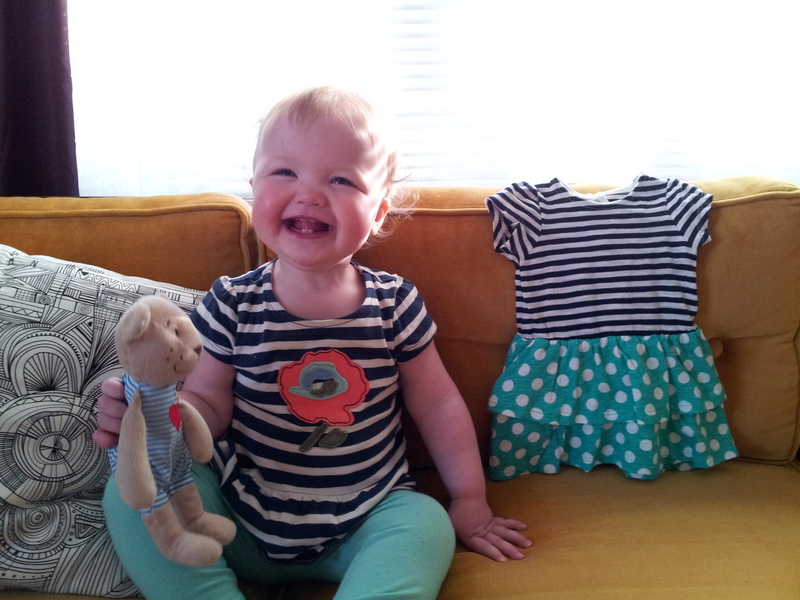 A Letter to Ellie: From Your Daddy. Today, I am blessed to share a letter my husband wrote to Eliana in celebration of her birth. While it’s not a traditional birth story, it is beautiful. Something I love about The Bradley Method is the emphasis it places on the role of Fathers in the delivery room and throughout the pregnancy. When people ask me how I gave birth without an epidural, my answer is always the same: because of David. So. Let’s be forthright, shall we? I love you. I love you more than words can say. 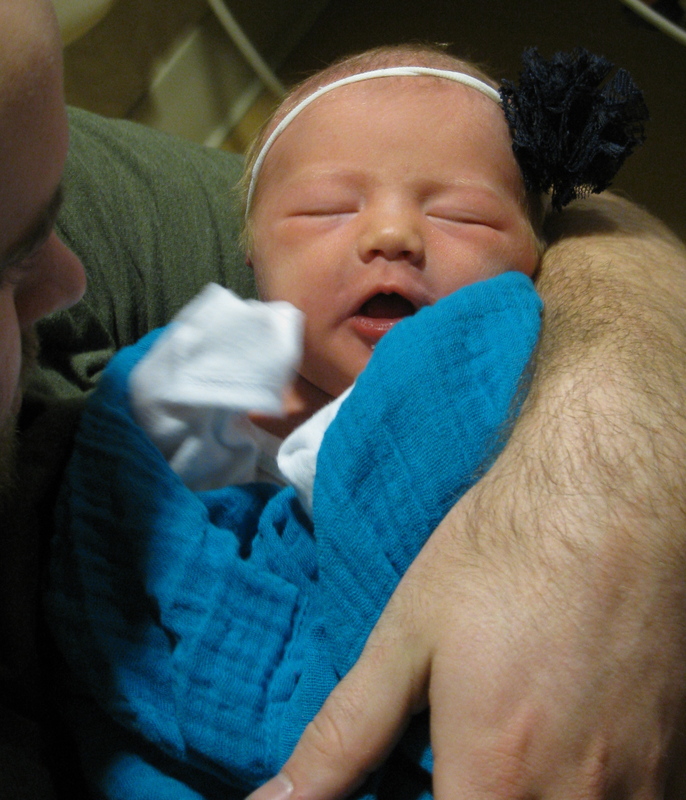 I remember very fondly the morning you came into the world. I stood at your mom’s side (her right-hand side, in case you’re interested in that sort of thing) with the nurse at her other side and the doctor at her feet. I like to think my eyes saw you first: you came out on the final push curled up and on your left-hand side, facing me. If you had opened your eyes at that moment, you would have seen me. Who’s to say you didn’t? Before the nurses picked you up and carried you away to be wiped clean (or washed clean, in which case it could be called a sort of firstfruits of the baptism that you will, I pray, one day undergo in the Lord), you were set in your mother’s affectionate and protective arms. I wish I could describe for you the look I saw at that moment on your mother’s face, but it transcends language. It was joy mixed with gratitude mixed with exhaustion–and probably mixed with pride. Pride in bearing you those nine months and giving you birth, gratitude to the Lord for his great kindness and care, joy at your life and at your entry into the world we inhabit only for a time, exhaustion and love suffusing it all. I hope my face showed something similar. Since that day you have grown quite a lot; you now are probably between 13 and 14 lbs and 25-26 inches long (from 7 lbs. 10 oz. and 20.5 inches at birth). You are, by the numbers, tall and thin–like your mother. Today, at nearly 16 weeks of age, you can hold your own head steady, sit in a supportive chair, lift your head up off the ground if we set you on your stomach, notice and follow toys or other objects, smile in response to our own smiles, and more generally show recognition of certain faces. We suspect you will start to roll over soon and not long after that begin to sit up and (too fast!) crawl. What progress you’ve made! I feel a keen sorrow almost daily–whenever I think that I spend too little time with you. I work full time at a job that doesn’t allow me to bring you with me. Your mother, on the other hand, works as a nanny, and therefore gets to take you with her to work. This arrangement has its upsides and downsides, of course, but it means at the very least that she spends more time with you than I do. I know, I know–this is normal in families like ours. But I wish to God that I had more time with you. How it feels to have your head resting on my left shoulder while I hold you with my right arm and touch the back of your head with my left hand–it fills me with happiness that I never knew before I had a daughter. You, Eliana, enrich my life and edify my heart. And you give pause to my mind; you make me weigh, make me consider what’s important and what, among the various goods I possess, can be let go. I remember in Gilead, my favorite book, Ames talks about grace as something that takes life down to the essentials. In that sense you are grace personified for me. That makes me think of Gerard Manley Hopkins’s poem, “Christ Plays in Ten Thousand Places,” in which Hopkins says that Christ is “lovely in limbs and lovely in eyes not his.” Yours are the limbs and eyes (and the smile!) through which Christ, right now, makes himself known to me. Okay, that’s a good place to stop. Child of my heart, hear my heart beat for you; know its affection for you, its desire that you grow up to be a woman who knows the Triune God and expends herself to the uttermost for His great glory. *If we are successful, David will attend the training with me and will have the option to help teach classes as he is able. Click here to become a part of our journey. Lovely Because He Loves Us. The air conditioner hums and I kiss my daughter on the cheek, the sour scratch of lemonade still fresh at the back of my throat. A fleeting memory blows through my mind like the breeze does on hot, humid summer days and I reach for my daughter’s story Bible, chasing it. I open pages to bright pictures of mountains and of birds, of smiling Adam and Eve, of curly blue-green ocean waves. I read the words out loud, but I’m really reading to myself. Oh, how those words quench my thirsty soul like that sour lemonade. I read on. And my voice breaks and a tear slips down my cheek. Lovely. Lovely because he loves us. Today I have looked at my sweet daughter and I have thought about the stab of harsh words and mean looks. I have remembered the cold sweaty feeling you get from overhearing mean girls whisper and stare. I have thought about how to prepare my daughter for this ugly part of being a woman. Today I have talked with my mother about why people argue and fight so much about little things like wearing bikinis, pretending like Jesus cared about things that don’t really matter and ignoring things that do. About why we choose to hold onto our soapboxes instead of holding onto one another’s hearts. Into all of this slip the sweet words of my daughter’s little story Bible. “They were lovely because he loved them.” Not because the mean girls accepted them. Not because they believed all the right things and refused to talk to anyone who didn’t. Not because they chose a hill to die on regardless of how many bodies fell around them. This is what I hope to share with my daughter. This is what I hope to learn myself. That I am lovely because he loves me. That they are lovely because he loves them. No meanness can take that away. No rejection. No inclusion. No stubborn stomping on a soapbox makes me more lovely or makes others less lovely. There’s no room for pride when my loveliness is a gift. No room for sulking because I haven’t been included. This is grace. We don’t deserve it and we cannot earn it. It made us lovely when we were not. And it changes everything. How do you prepare your heart for a move? When echoes bounce off bare walls and brown boxes take the place of table and chairs, when the packing tape roll runs thin and the long-settled dust gets caught up in the air like dandelion seeds on a summer afternoon. How do you secure your heart against the rising doubts while you secure the four corners of each brown box? How do you roll off a length of tape and gently smooth your hand over it, not knowing where or when you will remove it? What are you supposed to feel when you tuck that box of chamomile, 3 months from expiring, between the grinder and the coffee canister and breathe a prayer that it doesn’t go to waste? Not for the tea’s sake, but for yours. How do you walk out those glass doors that once opened, now slowly closing on people and a place that you love? How do you remain faithful when your place is so changeable? How do you anticipate when your way is so darkened? How do you hope when disappointment has marked your heart the way you marked each brown box? What do you do when the to do list seems so long and the laundry has piled, when every day the phone doesn’t ring is another day waiting? What do you believe when you can’t believe that everything will always be alright? How do you hope when you cannot see your way? How do you get excited when you know that you might be on the verge of the hardest thing you have ever done? When the move is exciting, we can hope in the destination. When the destination is unknown, where do we hope? And how do we hope? When the searing memories from the last time still burn deep? When we know that he is always faithful, but sometimes life is still very painful? I sit down and lean my head back slow. And the peace washes over me like the slow morning waves would. Be still. And know. And there in the quiet, those familiar words come join the questions swirling in my head. Not loudly but quiet. It is a whisper I hear as I sit.